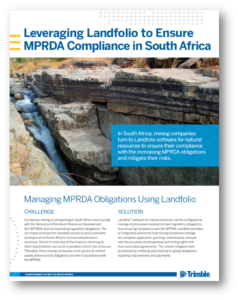 In South Africa, mining companies turn to Landfolio software for natural resources to ensure their compliance with the increasing MPRDA obligations and mitigate their risks. Companies mining or prospecting in South Africa must comply with the Mineral and Petroleum Resources Development Act (MPRDA) and corresponding regulatory obligations. The act makes provision for equitable access to and sustainable development of South Africa’s mineral and petroleum resources. Failure to meet any of the financial, reporting or other requirements can result in penalties and/or loss of tenure. Therefore, these mining companies must secure all mineral assets and ensure all obligations are met in accordance with the MPRDA. Landfolio® software for natural resources can be configured to manage all processes required to meet regulatory obligations, thus ensuring MPRDA compliance. Landfolio provides an integrated solution to help mining companies manage the complete application, granting, maintenance, renewal and closure phase of prospecting and mining rights and their associated agreements. The system mitigates risks by scheduling, notifying and tracking on-going obligations, reporting requirements and payments. Improves risk mitigation using an early warning system to ensure that all obligations are met. Provides a secure and accessible data and document repository for all correspondence, reports, agreements and contracts relating to the management of land-related assets. Configure workflows for all internal company processes in addition to the MPRDA jurisdictional requirements. Assign responsibility and accountability to specified users. Generate high level reports for budget forecasts, statuses and upcoming obligations. Improve governance and compliance using standard procedures and defined business rules. Rio Tinto Exploration contracted Spatial Dimension to implement FlexiCadastre to manage compliance across their land tenure and contracts.